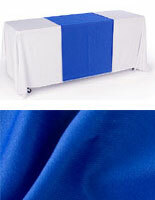 These table accents, table runners are designed to drape over an existing table cover. 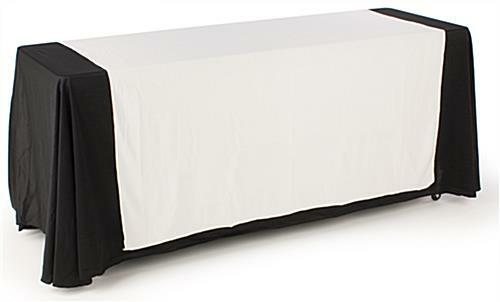 Contrast the white cloth against another color for an appealing display. 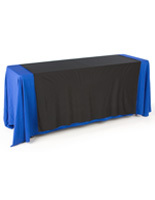 Thanks to the 80" length, these cloth runners will fit any size table. 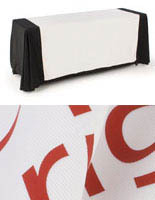 These table overlays are the table runners most people order for a hassle-free way to add style to your exhibit. 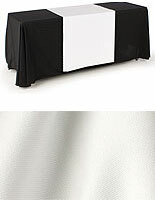 Table runners, such as table covers and overlays, are the most economical way to dress up old registration or trade show tables. (Check out our prices, need we say more?) 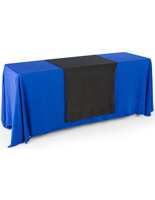 These table runners also come with their own fire-retardant certificate from an independent testing facility. This document would come in handy if so requested by the Fire Marshal at the trade show! 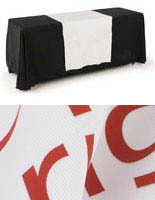 We offer table runners in plain format or with your custom imprinted text. What's more our runners are machine washable and iron safe, very important considering these are white. 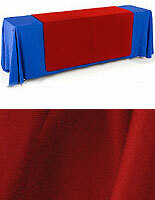 Try a table runner for your next event! Matoshia, we're so sorry that your table runner arrived with dirt streaks. We completely understand your frustration as this is not the quality we strive to deliver, nor is it reflective of who we are as a company. Fortunately, these table runners are machine washable, so the dirt streaks should come out in the wash. We'll have our customer care team reach out to assist. Thank you for bringing this to our attention.